← Christchurch, New Zealand. December 27th, 2011. Customers in a Lower Valley neighborhood have running water again after broken pipe shut off service this morning. 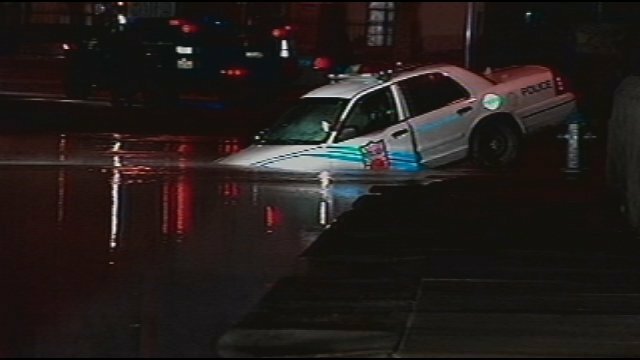 That water main break created a giant sink hole, that was big enough to swallow part of a police car. Neighbors near the intersection of Rusk and Pecos woke up to quite the mess this morning. El Paso Water Utility crews spent the morning pouring dirt into the large sink hole that opened up during this morning’s water main break. They had to shut off water to about 40 neighbors to fix it. Gerome woke up around 2:15 this morning to a strange sound coming from her front yard. “I heard what sounded like water rushing,” she said. She opened her front door and couldn’t believe what she was seeing. “To my shock there was just a river of water running though the front yard,” she said. She went back inside and picked up the phone. NewsChannel 9 asked El Paso Water Utilities spokeswoman Christina Montoya why the customer service line was busy and Gerome couldn’t get through. Montoya says the line was probably busy because several people were calling it at the same time to report the gusher. Moments later, Gerome says she saw a police car drive down the street and plunge into the sinkhole. 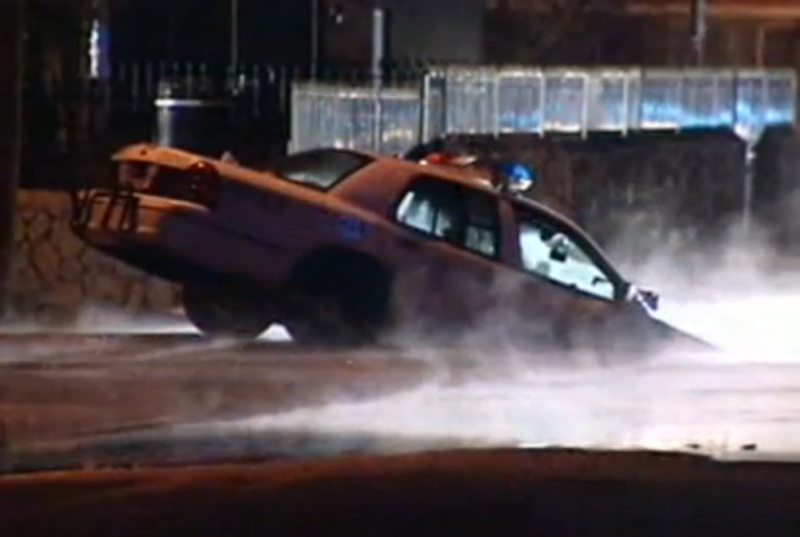 The front end of the police car disappeared into the water. Gerome couldn’t believe her eyes! 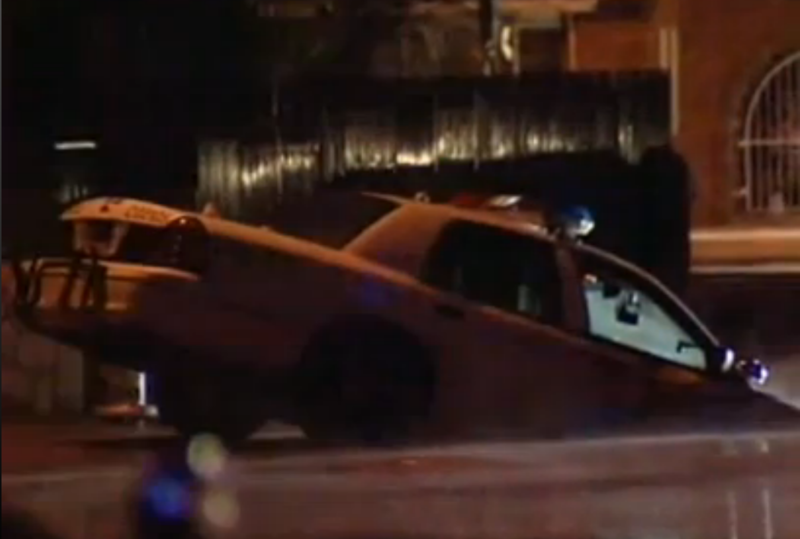 The police officer wasn’t hurt and climbed out of the car to safety. 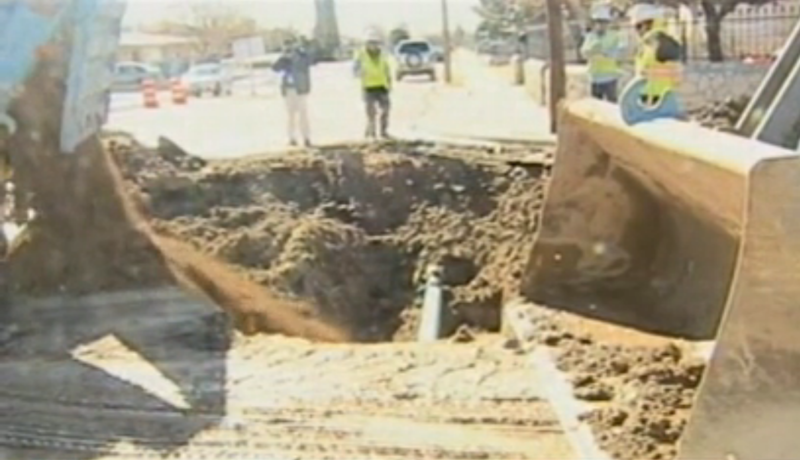 A spokesperson for El Paso Water Utilities says the cause of the water main break is still under investigation. It could have been caused by anything from aging pipes or just too much water pressure. This entry was posted in Pictures, Vehicle v Sinkhole and tagged sinkhole, sinkhole v car, Texas sinkhole. Bookmark the permalink.